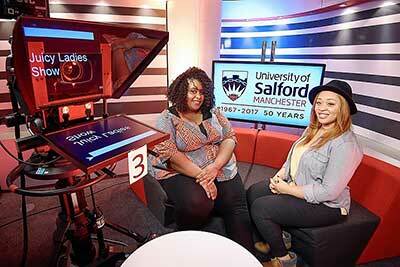 A student at the University of Salford is to present a show on the largest Christian TV network in the world. Lavinia Goddard will anchor the magazine show, which will be broadcast to millions in the UK, Europe and Africa. The programme will be co-presented by Lavinia’s business partner Adaeze Chiwoko, and will feature music news and live performances by contemporary Christian artists. Among the stars already set to appear on the show are former boxing champion Nigel Benn, and X Factor finalist Jahmene Douglas. It will air on Trinity Broadcasting Network (TBN) in the spring. Lavinia co-runs Vinejuice, a popular urban culture promotions company based in Oldham, which was founded in 2015 after the marketing student won a competition by the University of Salford enterprise team, to receive mentoring for a business start-up. Future TV star Lavinia, 36, said: “I’m so excited for the filming of the show to start. It is the largest thing that I and Adaeze have ever done. The show will be a celebration of Urban Christian culture, and it will be a real mix of people who are doing cool stuff. There will be music and interviews with actors who are at the top of their game and big sports personalities”. The 12-part series, called The Juicy Ladies Show, will begin filming at TBN’s London studio near Wembley in two weeks. Lavinia and Adaeze first met at high school, however it was not until they coincidently bought a house two doors down the road from each other on the same street in Gorton, that they rekindled their friendship and eventually became business partners. Adaeze, 36, who is a mum of three children aged 10, 7 and 6, said: “We had a successful radio show, where we were known as the Juicy Ladies, and from that we began to produce Facebook live videos. Last year we emailed TBN, and explained that we were really interested in presenting, and we asked what opportunities there may be. Lavinia added: “When TBN said they were interested in speaking to us, to even get an interview in the first place was mind blowing, so of course we jumped at the opportunity. My lecturers and the Enterprise team at the university have been great supporters of this venture, and they have encouraged me from the beginning”. Last month, Lavinia and Adaeze were on the committee of the MOBO awards, after organisers contacted them through their business. The role on the committee meant that they had a vital say in which artists received awards in several of the MOBO categories. Alex Fenton, a lecturer in Digital Business at the University of Salford, who helped to facilitate the competition that Lavinia won, said: “Lavinia is a shining example of what can be achieved as a Salford student. She put into practise her business school degree skills and blew away the competition at our annual Creative Entrepreneur Tech Angels innovation competition at MediaCityUK. Winning the competition was a massive boost for Lavinia and Vinejuice. The Tech Angels were so impressed, they decided to further back and support her and the idea. "This is exactly the kind of opportunity we are creating at Salford, working with industry and creating opportunities and experiences for our students. Students like Lavinia use these opportunities as a springboard from their degree to continued success”. Lavinia is currently putting her studies on hold until September while she films the TV show.